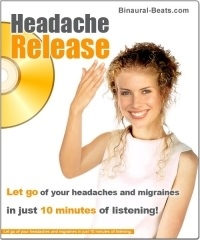 Using the Headache Release MP3 couldn't be simpler! Like all our binaural beat recordings, simply slip on your stereo headphones and press the "Play" button on your MP3 player. The binaural beats will automatically begin affecting your brainwaves, and you'll soon realize the benefit - no more headaches and a clear, fresh mind! You clutch your head. This is painful. You hate headaches, the harsh banging, throbbing, swelling pain. Migraines are even worse. Why can't they just DISAPPEAR? Of course, you know what to do. Sitting back, you slip on your headphones. There's no need for aspirin, Ibuprofen, or other pain killers. The MP3 begins to play its soft swishing tones and you feel instantly relaxed. You feel the muscles in your body suddenly begin to just let go. Then you realize the binaural beats are soothing the hard, unstoppable pounding of your headache, slowly taming the force. It's forced to slow down... to do as the MP3 says, not as the headache wants. You relax some more. You know it's okay just to let the binaural beat recording do its job. You think happy thoughts and begin to feel great. Soon, your quick ten minute session is over. And you suddenly realize what you started for... your headache! It has, of course, totally vanished. Blown away by the binaural beats. Now, you feel great. The pain has totally disappeared. Your head feels bright and clear. Total relief. Fantastic! "I bought the Headache Release MP3 from you in January. I've had chronic, severe migraine for 40 years. This MP3 cured me!!!" Notes: Track one serves as a quick headache release, design to bring relief for people on-the-go. Track two acts as an intense treatment for people with severe headaches and migraines. It utilizes varying and gentle modulation and panning effects to reduce "head throbbing". Track two includes a surf background, and includes modulation effects.